So today I finally got to see Harry Potter and the Cursed Child, after, like many of you, avoiding the spoilers until the script book release, or in my case, waiting to see the play itself. #KeeptheSecrets was the hashtag, and with this review I will try to remain true to that, even though many of you have delved into the story of the script book release (I kept saying script book for good reason) and know by now, the fate of Harry and Co. all these years later. Wow. I’m not a big theatre go-er, forgive me, but of all the plays I’ve seen, I find the medium quite tedious. But wow. I had that feeling, from the very beginning, to the end and throughout the whole play. Never before have I seen anything quite like the production of Harry Potter and the Cursed Child. If all theatre was like this, you’d catch me there every week. I mentioned before that I was glad I hadn’t read the script book, and that’s because I don’t think anything written on those pages, nor your imagination could prepare you for what you see and experience inside the Palace Theatre watching this show. It is a show. It is a spectacle. It is magic. 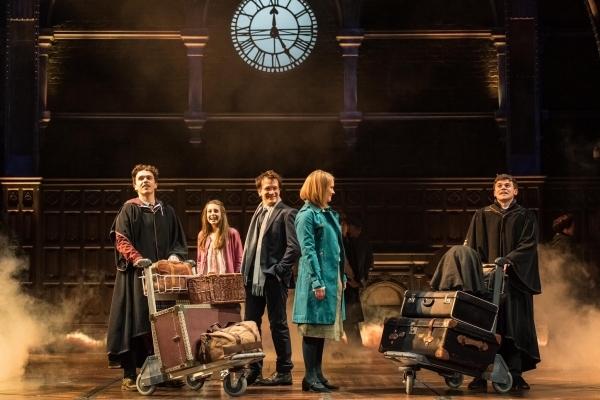 2016 has seen the introduction of virtual reality and immersive experiences, but the Cursed Child is as real and as close as it gets without putting on a headset. This story was never meant to be taken in via the page and written word. For Potter fans unable to get to the Palace Theatre in London, I’m sure the script book is just a compromise, or perhaps even a misunderstanding that this is Jo’s 8th book. That’s the way I treat it, though I will probably have a greater understanding when I read it, but the play is the play, and should only be accepted as such. It initially came as a surprise to me to see some negative reaction towards the script book, and having watched this show, I see why. As I mention above, this isn’t the 8th book. Reading it on the page is not going to give you the same experience you had reading the seven Potter novels. This also isn’t written by Jo, I feel silly for having to clarify that, but you’d be surprised. This is a collaborative story by Jo, John Tiffany the director, and Jack Thorne who penned it. It’s not going to have that original feel because Jo is a very unique writer and you can feel her presence when you read her writings. So what you have to accept with the Cursed Child is that the medium is the stage and the theatre. The story has to be influenced by those parameters and the form itself. I could waffle on, but mainly I just want to ask Potter fans to not be so precious. I loved the show. I was in awe. I laughed. I sat in silence during the tense moments. I got liquid eyed during the sad moments. I looked up. I looked down. I looked everywhere. The Wizarding World comes alive, it’s different, it’s a little bit mad, but it made me feel good. Oh and having Helena Bonham Carter sat in front of you, and hearing her cackle like Bellatrix every so often, well, that was the icing on this delicious experience. Go see the play. It’ll be the one of the best things you ever experience. Order the Harry Potter and the Cursed Child script book hardcover on Amazon.com, Amazon.co.uk and WBShop now. ive read the screen play twice and i would read it again and again!!! I would love to be able to see the play. Read it three times already and I would read it again. It has flaws, but I still love it.